The UCLA/Getty Conservation Program is pleased to welcome Visiting Postdoctoral Scholar Jenny Hallström. 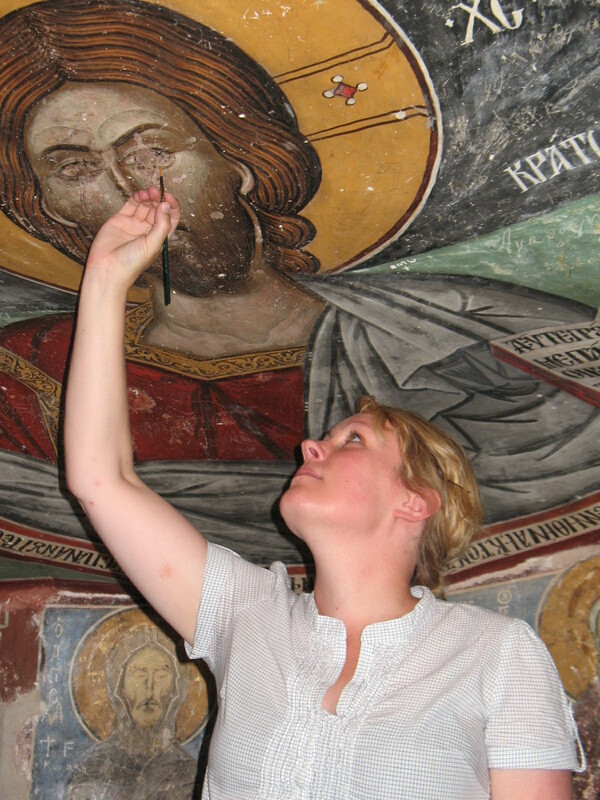 Jenny received her PhD in Engineering/Architectural Conservation and Restoration from Lund University (Lund, Sweden), and her focus is on non-invasive imaging and spectroscopic techniques of movable and immovable heritage. Under the mentorship of Prof. Ioanna Kakoulli, she will pursue research into the use of multispectral imaging for non-invasive diagnostics of surfaces and documentation of cultural heritage which could benefit from minimal intervention, future protection and preservation of artifacts and buildings, as well as the mitigation of the decay of materials. Her current project involves a study in collaboration with the Fowler Museum at UCLA exploring the potential of using non-invasive methods of examination and analysis combining broad band digital and multispectral imaging (from the ultraviolet to the near infrared region of the electromagnetic spectrum) with portable x-ray fluorescence (XRF) and ultraviolet/visible/near infrared (UV/Vis/NIR) spectroscopy for the documentation and recording of two Balinese paintings. This summer she also participated in the field work of documenting the caves of St. Neophytos Monastery in Cyprus. Jenny will be a scholar with the conservation program through mid-January 2010. Categories: Uncategorized | Tags: Balinese painting, Fowler Museum, Hallstrom, Kakoulli, multispectral imaging, non-invasive imaging, St. Neophytos Monastery, ultraviolet/visible/near infrared, UV/Vis/NIR, x-ray fluorescence, XRF | Permalink. The latest issue of Backdirt, the annual magazine of the Cotsen Institute of Archaeology, highlights some of the projects undertaken in 2009 by students and faculty of the UCLA/Getty Conservation Program. Professor Ellen Pearlstein shares her findings from a technical study of a Native American feather blanket. Categories: Uncategorized | Tags: Backdirt, Byzantine, conservation program, Cyprus, feather blanket, Genbrugge, Horelick, internship, Kakoulli, Liang, Lin, Morris, Native American, Pearlstein, St. Neophytos, UCLA/Getty, wall painting | Permalink.